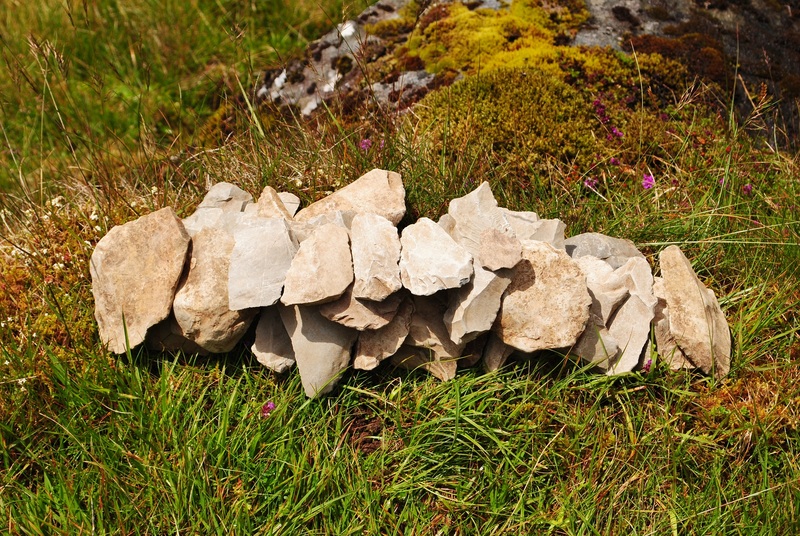 The Sherds and Shards were found in July 2017 on the shoreline of a small cove on the east side of Eilean Na Hearadh (Isle of Harris) in the Na h-Eileanan Siar (Western Isles). Overlooking the cove is a house, that originates from the late 18th century, the waste from which was probably flung by its residents into the sea for over two hundred years. The sherds and shards have remained upon the shoreline and have become transformed by tidal rhythms and storms, scoured and smoothed, sharp edges blunted and bright surfaces dulled, all now more rounded and pebble like. What I found most striking was the high proportion of materials, which were clearly worked through the beach deposits. Two hundred years of human refuse disposal from one dwelling had transformed the shoreline geo-morphological sediments of the cove. The pieces of ceramic and glass forming the installation on the shoreline were only collected from the surface of the beach, below the surface are much greater numbers of sherds and shards. Sherds of ceramic and shards of glass are relatively stable as materials, unlike the floating and volatile plastic containers, nurdles and microbeads, which are now permeating our water and littering our beaches, the chemicals from which are extending through the food chain with building levels of toxicity to all life forms. 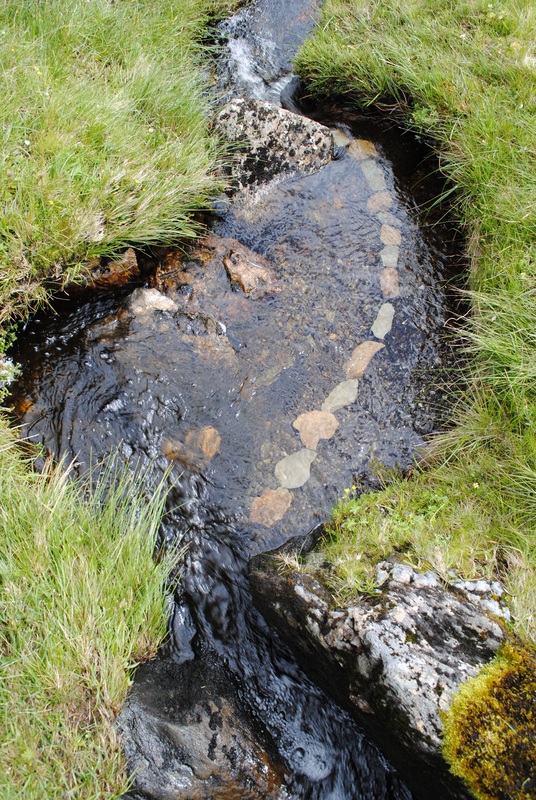 The Ballachulish Goddess was discovered in 1880 beneath about 10 feet of peat. How remarkable it would have been, when she was first lifted to gaze upon her, or rather for her to see again, to gaze upon us, for the first time in over 2000 years. Whether deliberately so, her eyes seem different. Her larger right eye appears to have a distinct pupil marked, as if staring directly at us, or forward into the distance. While her small deeper set left eye, evokes an inward contemplation, perhaps a second sight to other places and times. Her mouth appears poised, as if about to speak to us, perhaps of some wisdom from the past or I can almost hear the first notes of a song emanating. Taken back to Edinburgh, she was uncared for, and as she dried out, her fabric twisted and split, presenting a countenance which differs greatly from her appearance of 2600 years previously. Now a look of shock, or worry perhaps, a permanent rigor mortis – her eyes pleading to be freed from permanent public display. Many have speculated, who she is and what she may have represented. Others have noted that the location she was left was a special place, next to a narrow water crossing, the successful navigation of which allowed travel on land up the west coast of Scotland. 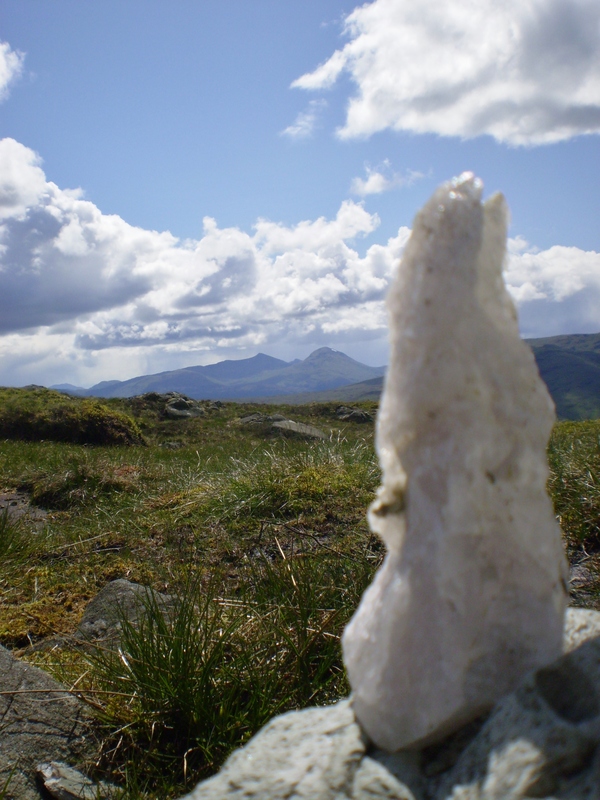 Some have noted, with the proximity to Beinn a’Bheithir, that the Ballachulish Goddess may in some way be related to the Cailleach Bheithir. Described by some as the winter storm goddess, responsible for sudden changes in weather, which even in April with snow in the corries and successive bands of icy rain sweeping across Loch Leven still seems within the Cailleach’s purview. I cannot contribute much to the story, like many before I wonder who she may have represented – an individual, an archetype, a goddess, named or nameless – perhaps all these at different times. However, I can reflect on the landscape she was found within and how earlier sites may reveal something of her nature. 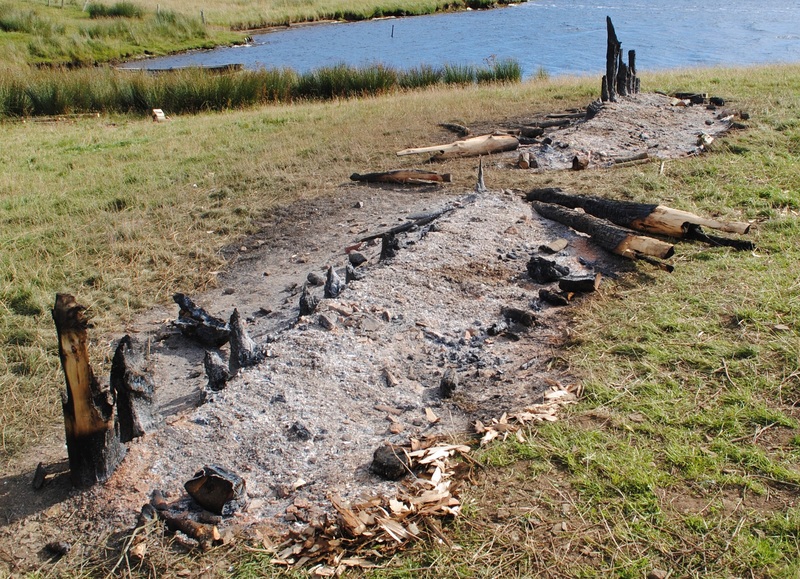 Other archaeological sites including cairns and burial cists suggest this part of the landscape had been used for ceremony and ritual by people in the third and second millennia BC. 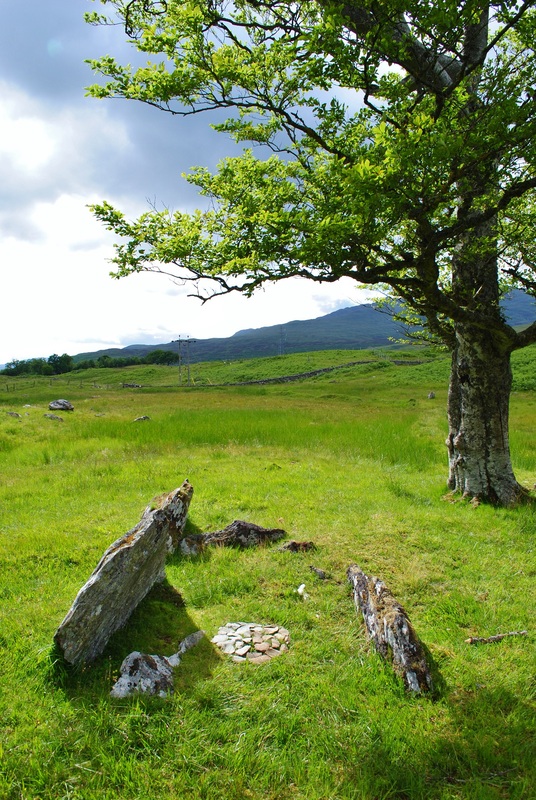 So the Ballachulish Goddess was located in a landscape which had a depth of story before she was created about 600 BC. 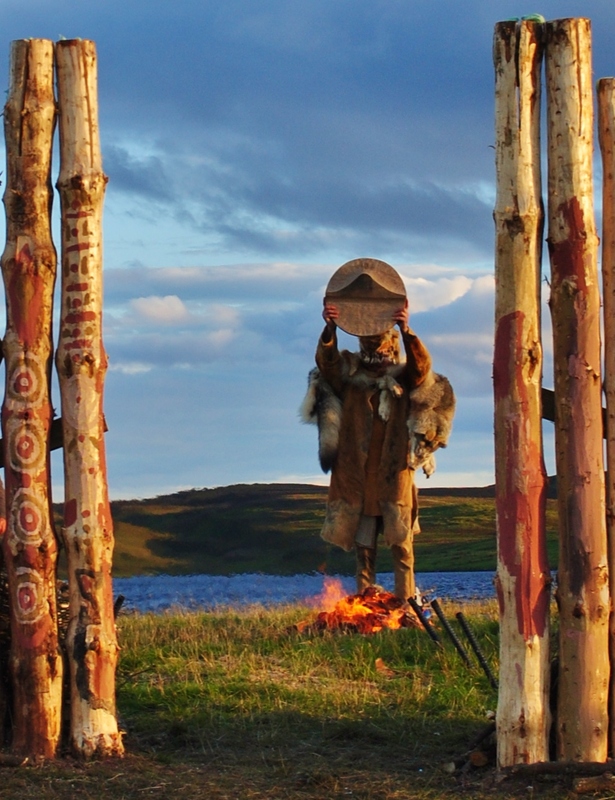 The location where she lay beneath peat for over two thousand years is on the brow of a raised beach. A shore line, when following the last ice age, sea levels rose rapidly and water lapped many meters higher than today. However, about 600 BC that raised beach line was already a distant memory and much of the ground below had been revealed by falling water levels. Where she stood, she looked over a small islet An Dunnan. When the water lapped at the raised beach line where the Ballachulish Goddess was placed An Dunnan would have been totally submerged. By the time the Ballachulish Goddess was actually placed at the raised beach An Dunnan had been emerging for several thousand years. Others before had marked these profound changes. On this islet, there is a small group of cup marks, a distinctive form of rock art dating from the the fourth millennium BC. As the water retreated and the island became accessible, perhaps a thousand years later people modified the rock with cup marks. Most striking perhaps is that they are adjacent to significant outcrops of quartz, which even today seem to flow or drip into the sea below. But in heavy tide or winter storm, they will be washed and partially submerged by the sea. 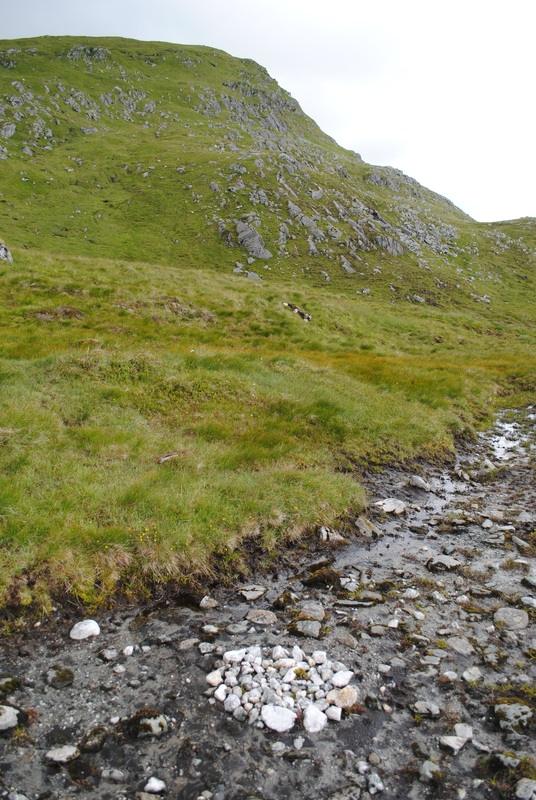 Where the Ballachulish Goddess was located was not only liminal in terms of the distance across a short, but potentially hazardous, stretch of water. The liminality was also temporal, a place of deeper time where sea and land played out a dance through millennia, as sea levels rose and fell, and then land sprang back up after the weight of an ice sheet lifted. 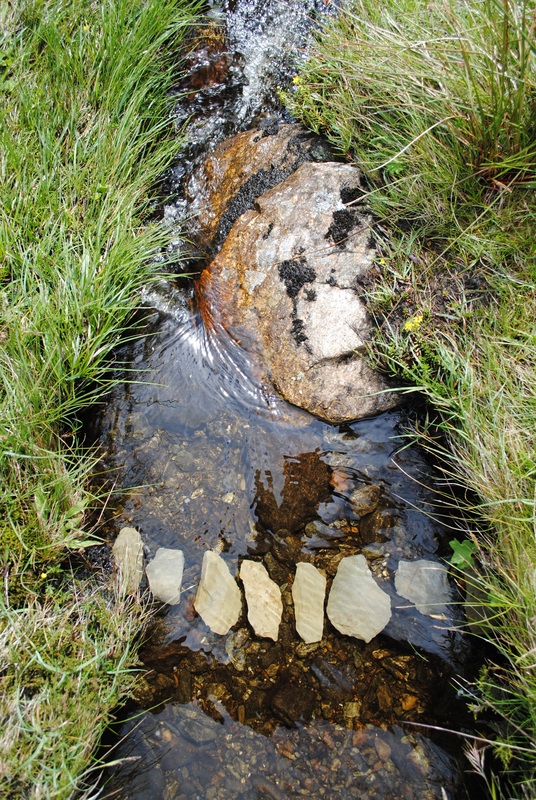 The Ballachulish Goddess stood poised above An Dunnan, with one of her eyes looking back to when people, perhaps two thousand or more years before had marked rocks revealed by watery transitions. One quartzite eye staring back calmly at the quartz which marked this place of rock-water which had been birthed as the sea levels fell. 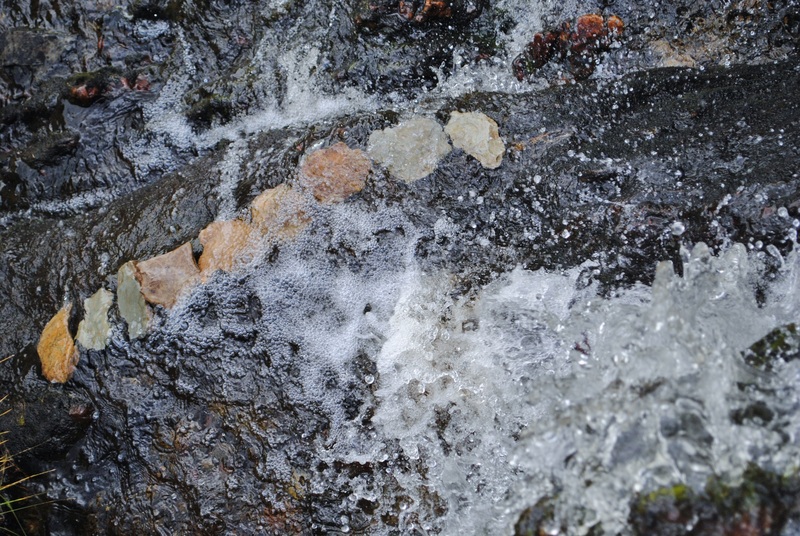 the dance of water-rock continues. 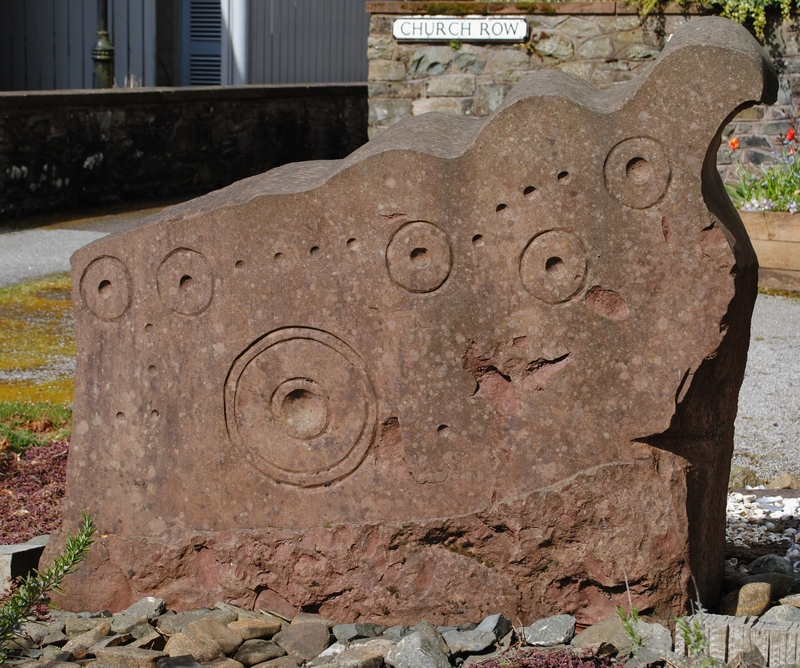 The images of the Ballachulish Goddess are from the National Museums of Scotland website where more information can be found. The original publication of the discovery can be found in Proceedings of the Society of Antiquaries of Scotland. And a brief introduction to some of the geology of the wider region. We Can Glow Like The Sun. I was privileged to stay nearly three weeks in Lithuania spending much of the time exploring aspects of its heritage and landscapes. The first week was spent at the wonderful Nida Art Colony, a creative center from which I explored the landscape of the Curonnian Spit. Located on the Baltic coast, the spit is about 98 km long, the northern part of which is within Lithuania and the southern part in the Kaliningrad region of the Russian Federation. I was drawn back to the Curonnian Spit, in part due to my interest in a Neolithic amber hoard, within which are a range of unusual figurative forms, that had been discovered in the 19th century at Juodkrantė. However I very quickly became more interested in a series of tensions and entanglements that the forested nature of the landscape and the elemental nature of amber began to reveal. The Curonnian Spit has a remarkable natural and cultural significance in part recognised with its inscription as a World Heritage Site in 2000 and its status as Kuršių Nerija National Park and as the Kurshskaya National Park of the Russian Federation. 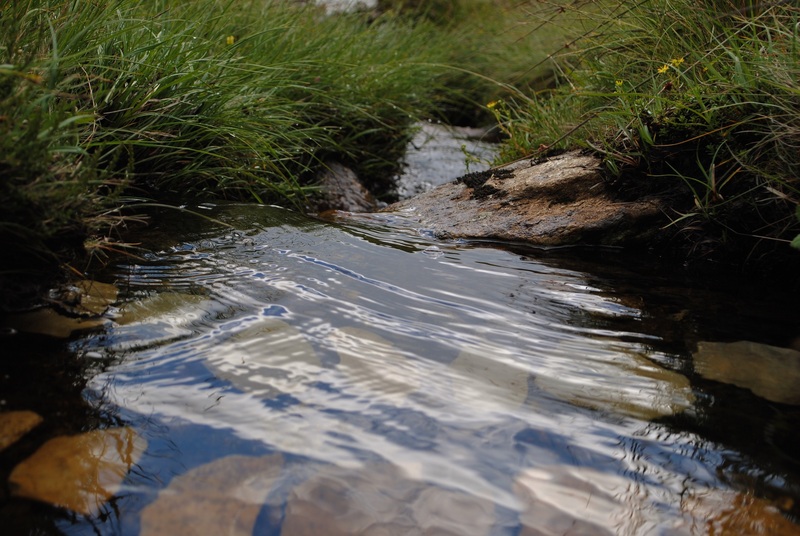 So interesting tensions can be encountered between geo-morphological forms, climatic processes and the movements of other species which do not recognise political boundaries and the management of designated landscapes. 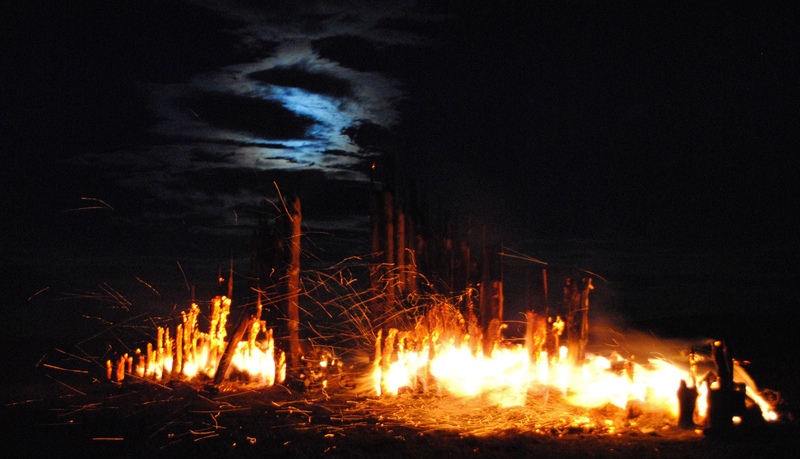 The landscape of the Curonnian Spit has been subject to major changes in character, sea level, deforestations, erosion and drifting of sands, and then reforestation and management. People have responded for millennia, and in part caused, some of these changes. For millennia they have encountered timeless gifts cast up from the sea. At times they reworked these gifts, and sent them back, perhaps in an attempt to make sense of or intervene in the world of change around them. 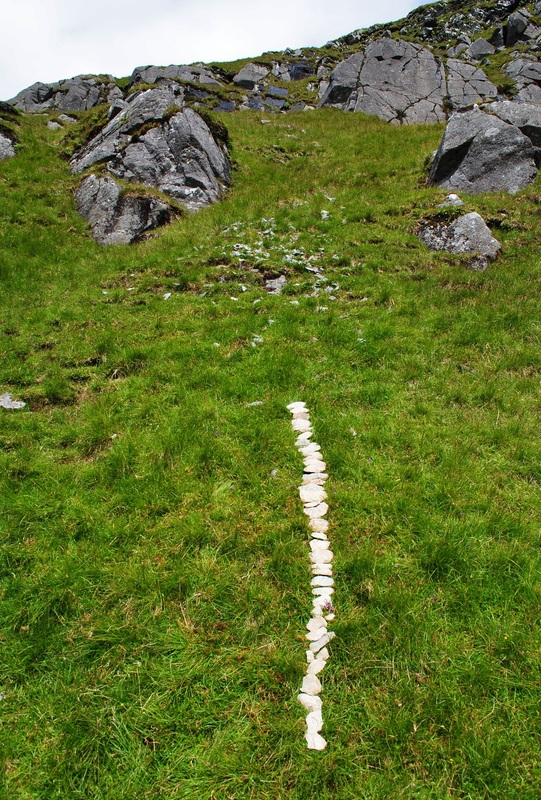 While there I worked on a piece through researching the history of the landscape and those who have dwelled within it for nearly 5000 years and by creating a series of small temporary installations in the landscape. 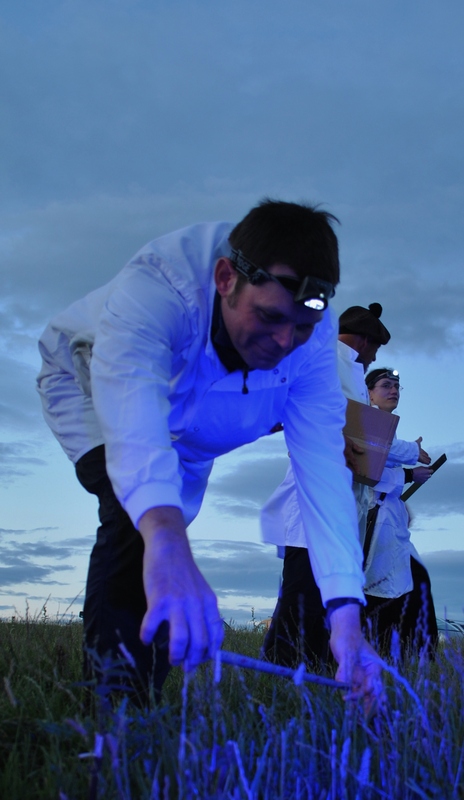 This resulted in the development of a piece Among The Dead Dunes Some Trees Glow Like The Sun which was performed the following week in Vilnius. The 12 minute performance explored the ongoing inter-relationships between people and landscape, and invited us to re-imagine the way we interact in the future. Rather than try to reproduce that performance here I show some of the elements which I responded too. Stonehenge, imagine being there, about 5000 years ago, when people first started building the earthwork enclosure. 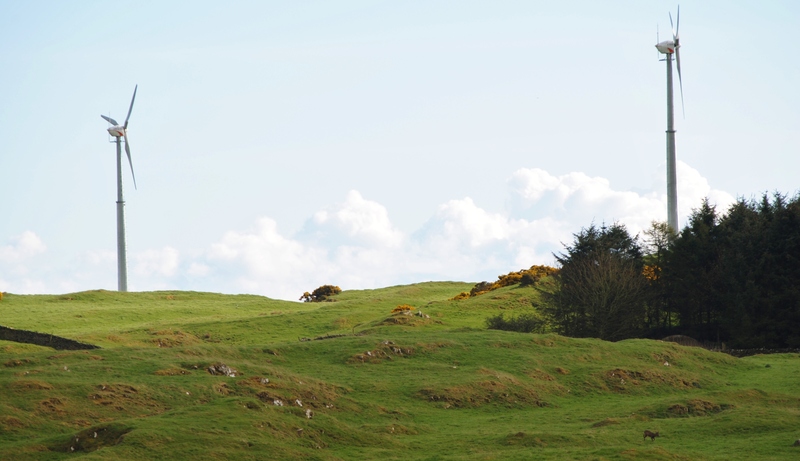 If you could linger, perhaps five hundred years later, you may have witnessed the first stone circle being erected. If you were able to revisit in another two hundred years time, you could have helped remodel the monument and created the unique arrangement of hanging stones which are celebrated to this day. Yet, it is easy to focus on the construction, physical representations of a will to transform, and overlook the long moments of reality when monuments were actively used. Monumental statements (fetishistic moments of monumentality) sit comfortably with contemporary concerns for master plans and iconic buildings : architect-planner-deity. Perhaps monuments such as Stonehenge, dangerously legitimise the short term political gestures (remember the difficult birth of the Millennium Dome ! ), grand projects of great people, and as such belittle the everyday, annual or generational uses of places we value? So it is with interest I have watched over the past few years the emergence of a new complex of stones at Crawick : which if witnessed by the monument obsessed archaeologist of the future could readily, mirroring contemporary archaeo-parlance, be described as a ‘monumental landscape’ but in the absence of overt function be easily classed as a ‘ceremonial landscape’ or ‘ritual landscape’. 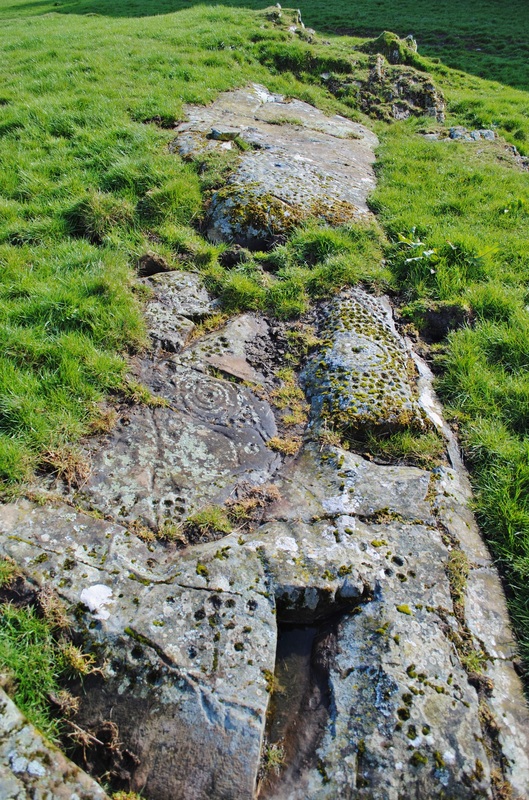 Yet Crawick is of its time, as post-industrial imagineering, an overt expression of regeneration, a cosmological dream beyond the short half-life of industrial decay. A solution to the problem of the blasted legacies of open cast coal extraction. So again, like Stonehenge, we are encouraged to focus on the monumentality of the project, the grand vision of the architect god. Yet it may represent a moment in time which is worth studying, as a contemporary archaeology, as an unfolding of possible futures. Crawick landforming (phase 1) completed 2015, how will decades and centuries of humanity respond to this new space ? 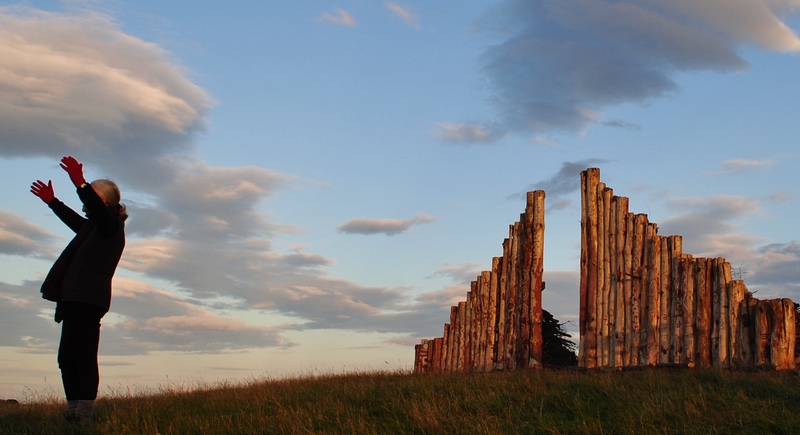 Our opportunity is to engage in the moments between monumentality : phase 1 completed 2015 and Crawick landforming (phase 2) due to be commenced in 2215 ! What potentials lie in new birthed spaces, what opportunities to explore and express in the longer flow of time ? 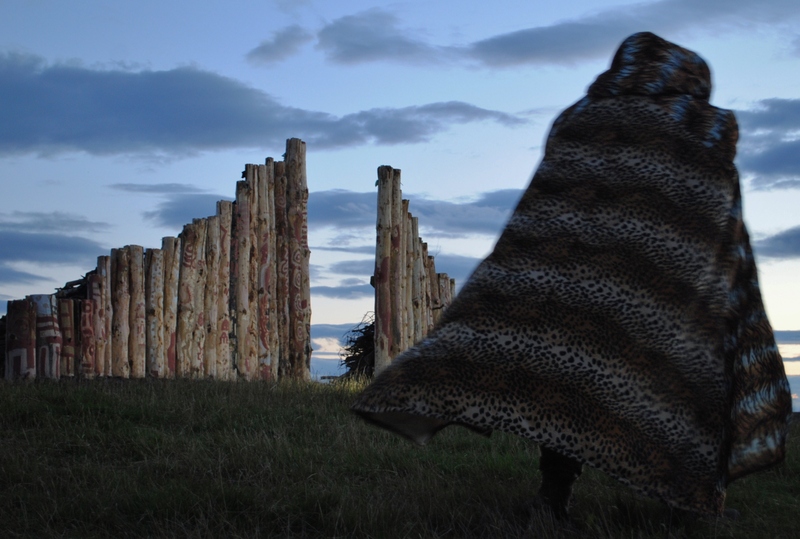 So perhaps at generational monuments like Stonehenge, what sang through the ages, was the joy of the use of the space, dance and music, life and death transforming to place. Perhaps such monumental places should be other worldly, liminal zones. 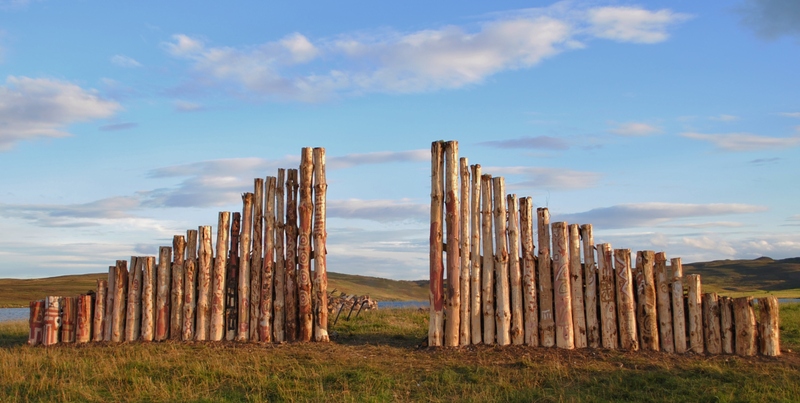 Places where we can encounter a pantheon of archetypes, explore the boundaries of humanity and through activities (perhaps challenging our definitions of art, culture and heritage) find pathways to revitalise earth from disturbed ground. but by the people who dwell there. 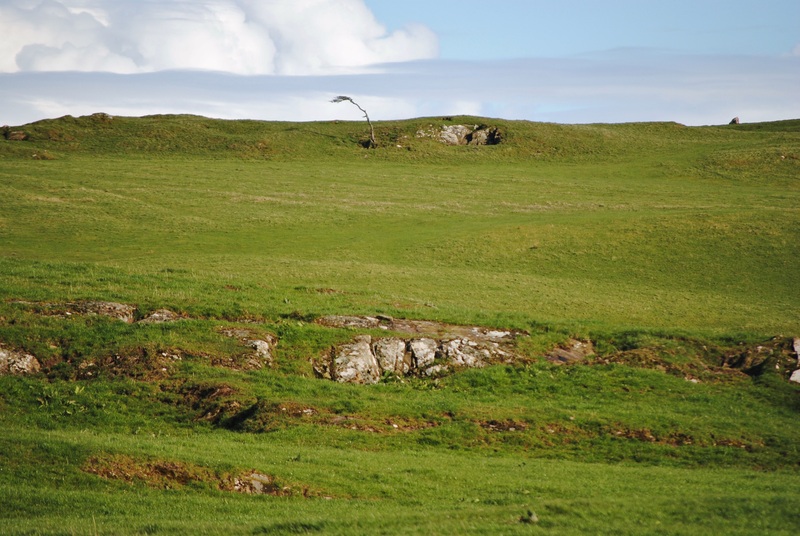 Following an encounter with another Land Formation by Charles Jencks, I learned about the plans for Crawick and visited in May 2014 when ‘land-forming’ works were underway. A subsequent visit was undertaken in June 2014 when we were kindly allowed in the site to see the work in progress. 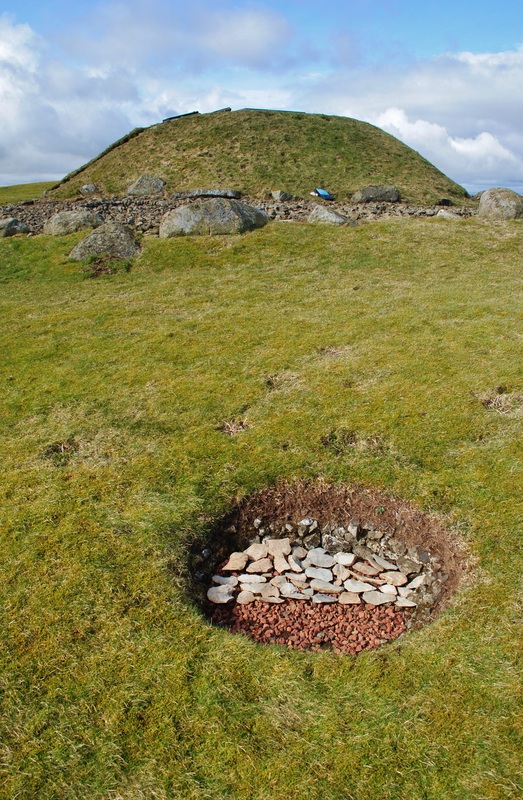 The next encounter with Crawick was when it was launched in June 2015. The opening weekend was alive with the wonderful performance by Alex Rigg and Oceanallover which forms the basis of the peopled images above : and the only time when the monument made sense ! 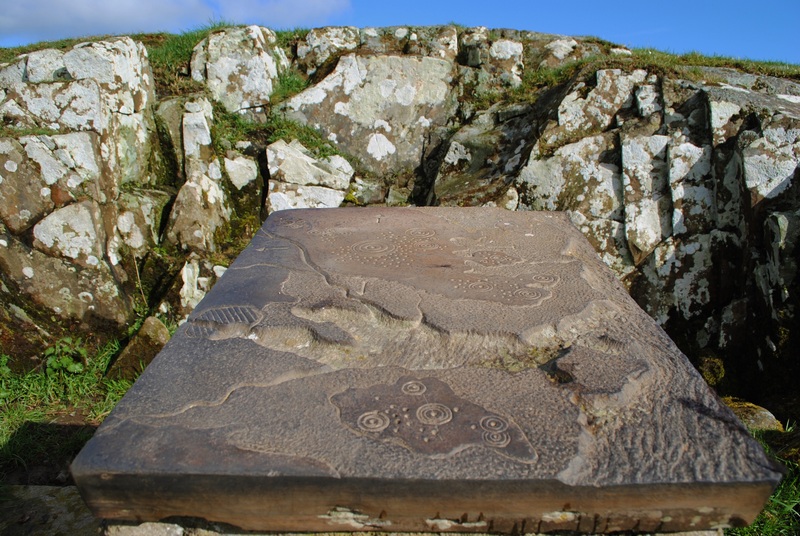 A further visit was undertaken in February 2016 with Kenny Brophy and Public Humanities students from University of Glasgow during which we had a heated debate about the cosmological frame of reference of the monument forms. A parallel perspective on this contemporary cosmological space was produced by the Urban Prehistorian. Collectively these visits, revealed the obvious, it is not the monument that matters or who conceived of it or who built it (sorry ! ), rather it is how it is used and by who and for how long – and that transcends the meaning assigned by the architect. Thus the stage has been created and the meaning will be writ in the long term by those who perform upon it and dwell with it. 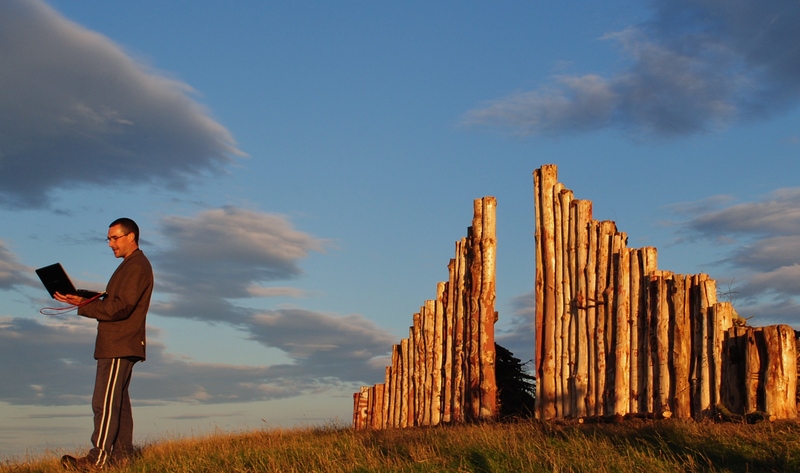 I wonder how the monument might change in use with Crawick landforming (phase 2), provisionally due to be commenced in 2215… … ! gives sense of warmth and light. never escape glare of guards. So try finding the darkness pierced by light. Fallen signs of medication and disease. Traces of nameless and named remained. Were their ever moments of humour and love? Patarei was one of the most disorienting and disturbing heritage sites I had visited. Patarei operated as a prison till 2002 and is described ‘as the most notorious prison in Estonia.’ It was recently shortlist nominated as one of the most threatened heritage sites in Europe and as such I thought this post may be of interest in the context of the Europa Nostra nomination by The Estonian Heritage Society. The images were taken in August 2011, and I am not sure what state it is currently in, but yet to this day, when I think of the visit to Patarei, it still makes me shudder. It was not always clear what had been left by prisoners, and to what extent it represented their experiences, or where later interventions of art or looting had modified the rooms and corridors. I remember being struck by learning that Patarei (in 2011) catered for stag and hen parties (providing drink, food and drink) : with the unwitting bride or groom having to spend some time in a cell during the evening. A form of entertainment which I was uncomfortable with : yet it was an attempt to ‘generate revenue’, to find a reuse for a heritage site. Like many heritage sites it faces the challenges of finding new uses but in the current economic climate probably will not find sufficient core funding to keep running without some other revenues. Finding reuse is perhaps even more challenging with a site which could be described as relating to ‘dark-heritage’. Difficult and painful places, which we must remember, and through which have to reconcile tensions from the past. There is a deeper story to Patarei, having been built as a military fortress at the instruction of Russian Czar Nicholas I from 1829 to 1840. The fortress was then converted into a prison, between 1920 and 2005, and became a powerful symbol of national resistance in Estonia to both the communist and Nazi regimes. A real challenge in these times perhaps, but I hope the site is not lost through further decay and neglect. Patarei is a remarkable part of the heritage of Estonia, and importantly it contributes to, and resonates in many ways with, the broader history of Europe which we all share. Can we speak of love…..
from the hard cold realities…. Can we speak of love…. but we are satisfied ? with the control of the uncontrollable…. 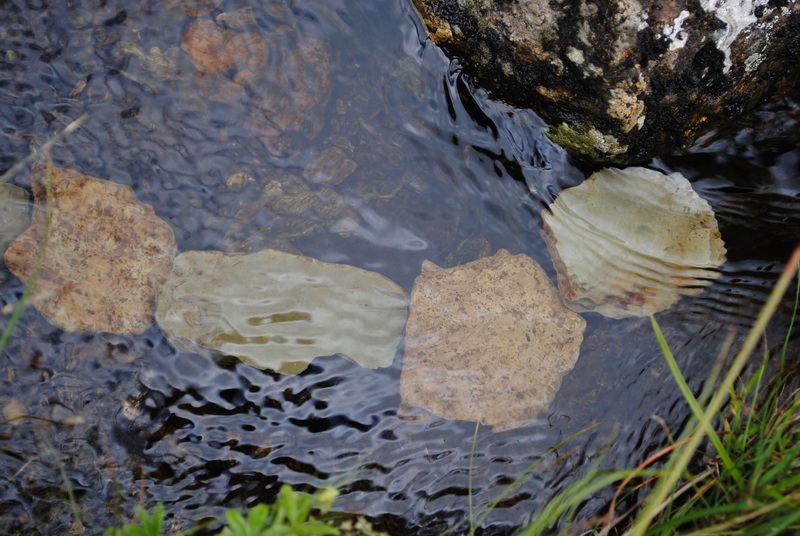 occasional glints, below the surface beckon Spring rains. The journey, the narrative continues…. One interest I have are the threads which can be drawn out and traced through the millennia. So slight, so fine, they can only be seen from certain angles – a flash, a glint, in peripheral glances – but I am sure they are there. 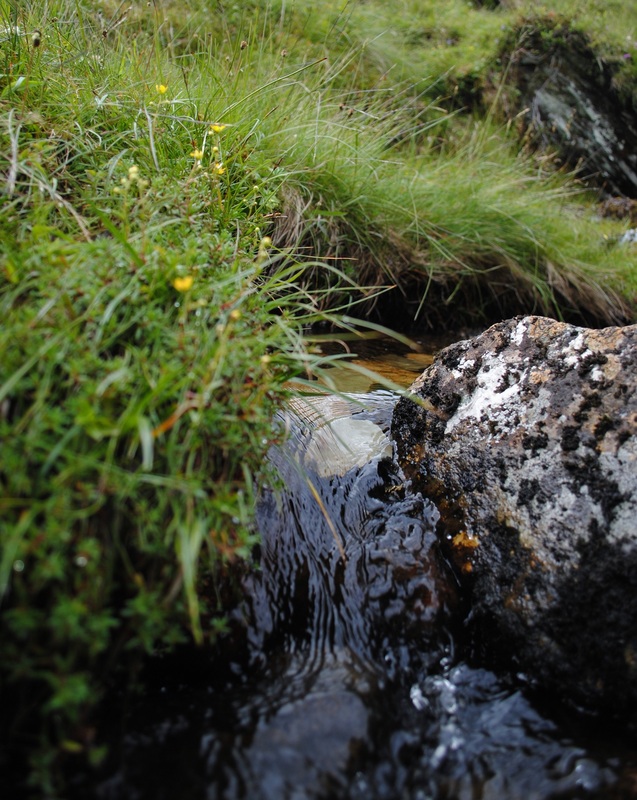 One fragile thread I have been teasing out was originally found in the uplands. 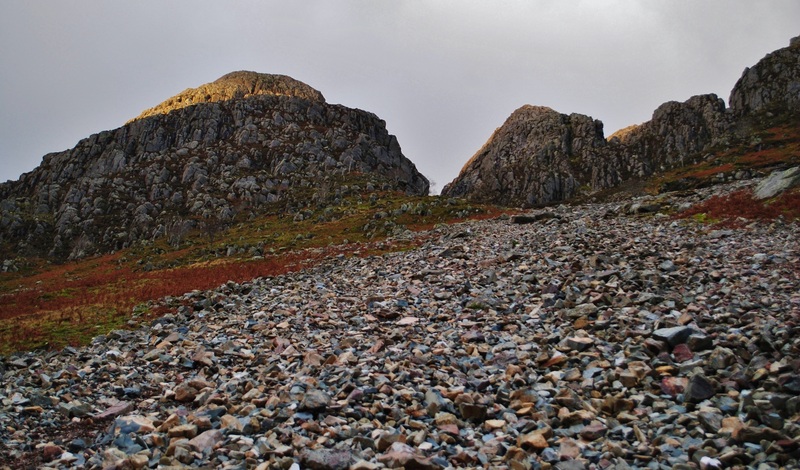 Five thousand years ago people quarried stone from mountain places such as the Langdale, Cumbria and Craig Na Caillich, Perthshire. From the stone they produced polished stone axes. Polished stone axes may have been considered prestige objects and often traveled significant distances, perhaps handed from person to person. Each time a polished stone axe moved, its story may have traveled with it linking time and space through the memories of generations. The piece I present in part here traces these threads and looks forward. 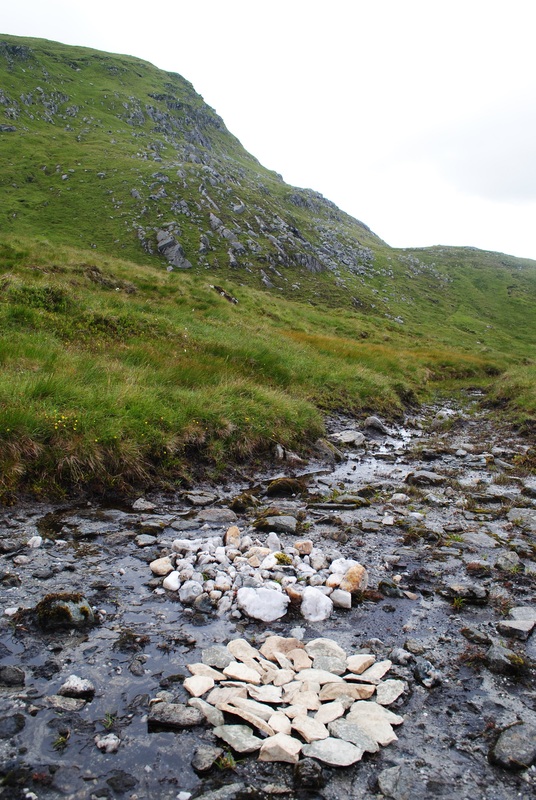 Some images show a small quartz cairn I first created in the uplands six years ago and how it has changed. Other images show large waste flakes from making rough out axes 5500 years ago: they had been excavated by archaeologists and they were going to be disposed of as no longer wanted for curation. 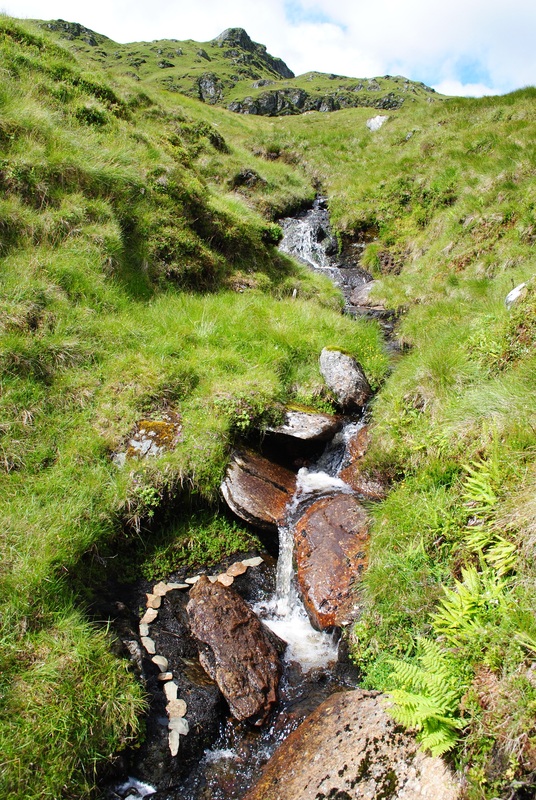 Many of the images relate to the burn which flows down from Craig Na Caillich axe factory, other relate to prehistoric sites where polished stone axes may well have been used and deposited. 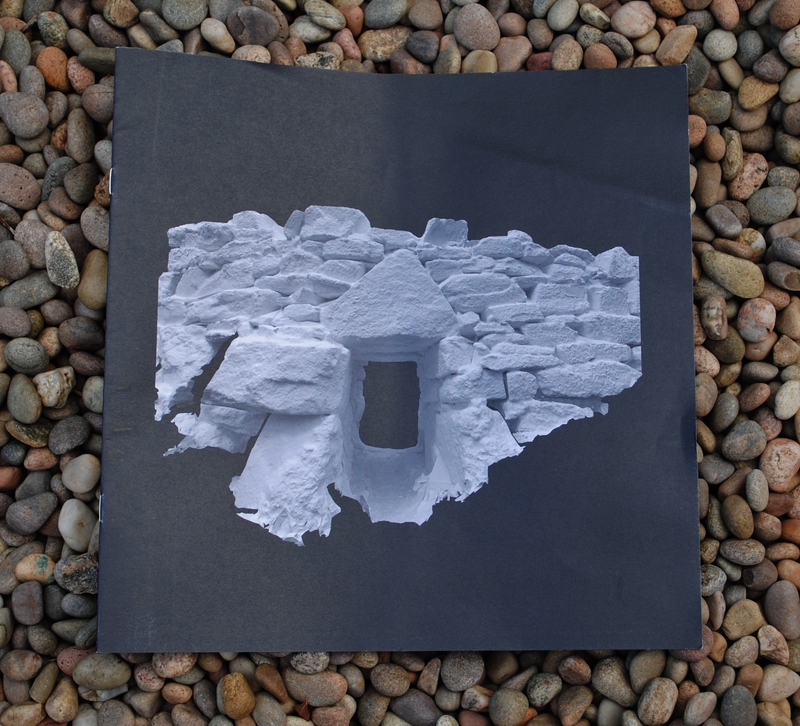 The piece was presented in the Creative Archaeologies session, co-organised by Antonia Thomas, Dan Lee, Carolyn White and Ursula Frederick, at the 2015 European Association of Archaeologists conference. 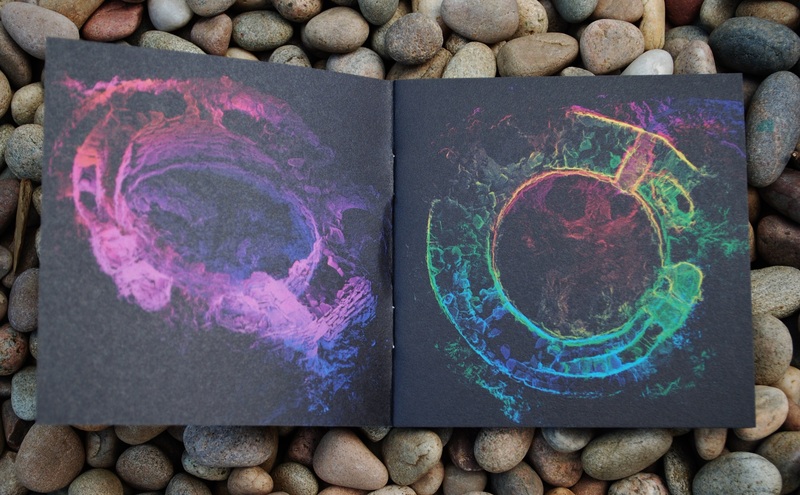 As part of the piece 25 boxes were given away and an invite extended to those who took them to collaborate in exploring the future chapter of what was inside. 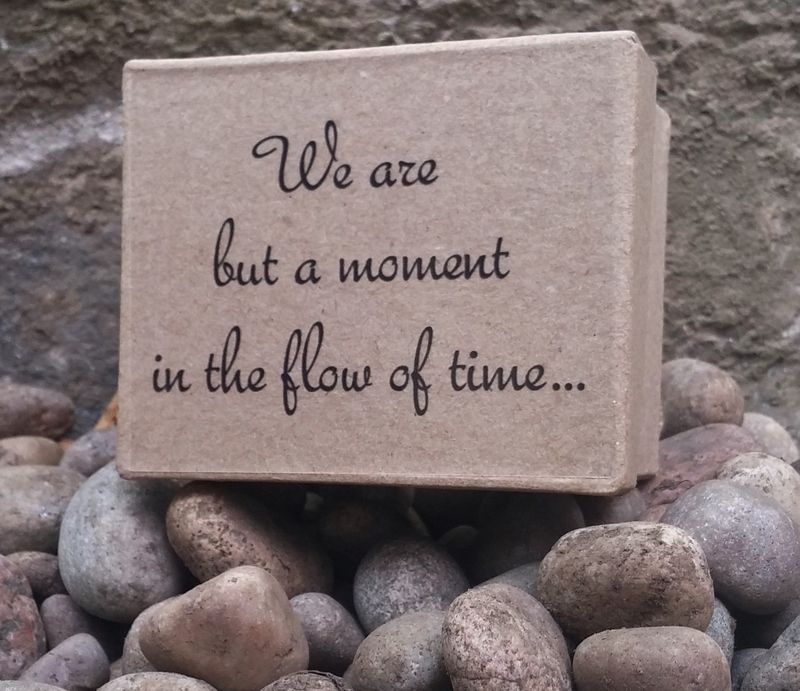 In The Flow Of Time We Are But A Moment …. 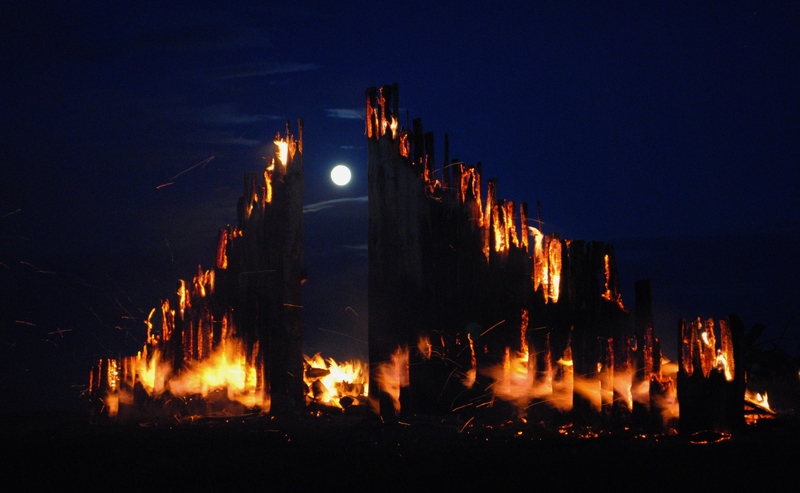 Fire and Moon are a powerful combination. 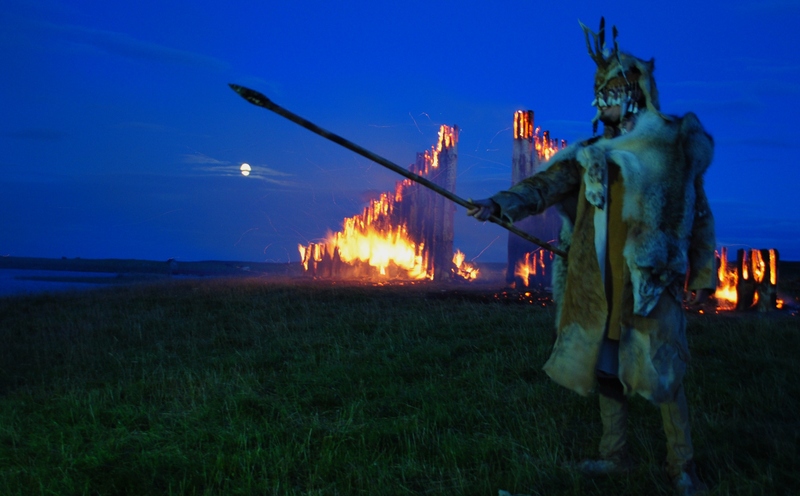 There is no doubting the importance both had in the past, both moon and fire were clearly incorporated into rituals and ceremonies for thousands of years. What may be less apparent is the power of groups of people building together, a communal effort to create not only structures but more importantly lasting memories of striking events. 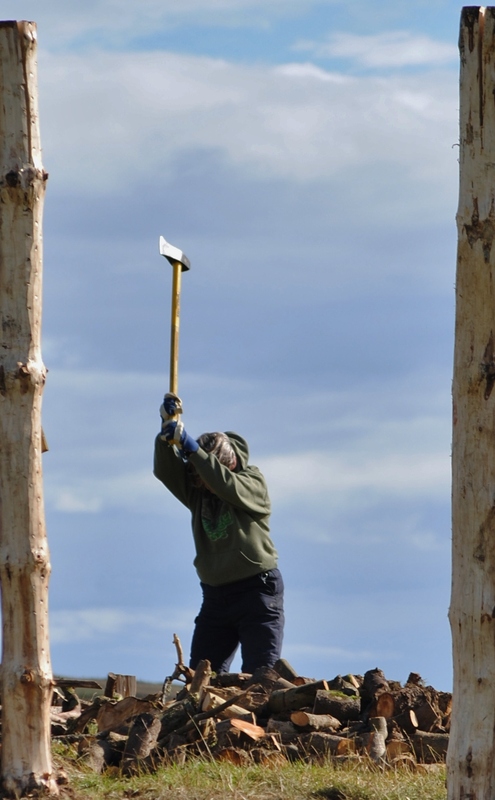 A week of preparations, involved felling trees, and hand breaking trenches through bedrock to hold the timbers. 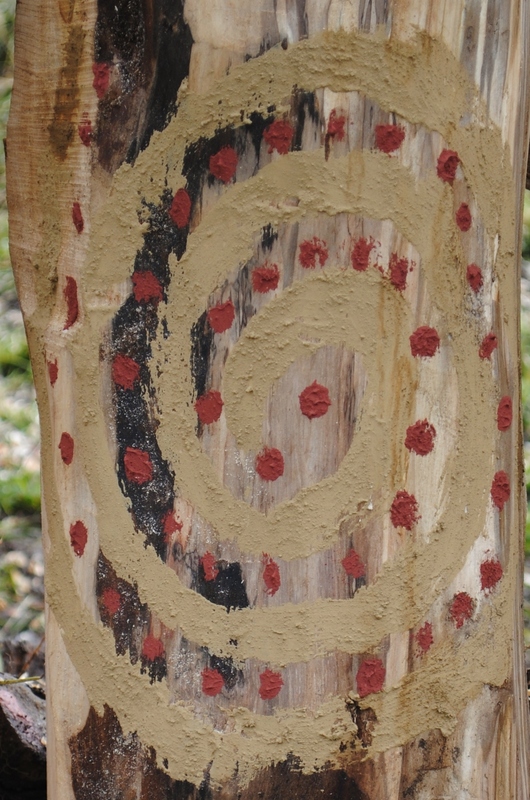 Posts were decorated using pigments found from local sources. Special objects were made in preparation of the events which were to follow. Everything was set for the arrival of extraordinary figures. for transformation, to find a different beauty in wood. An illumination cloaked in possible pasts. An intensity of insight, focused at night. 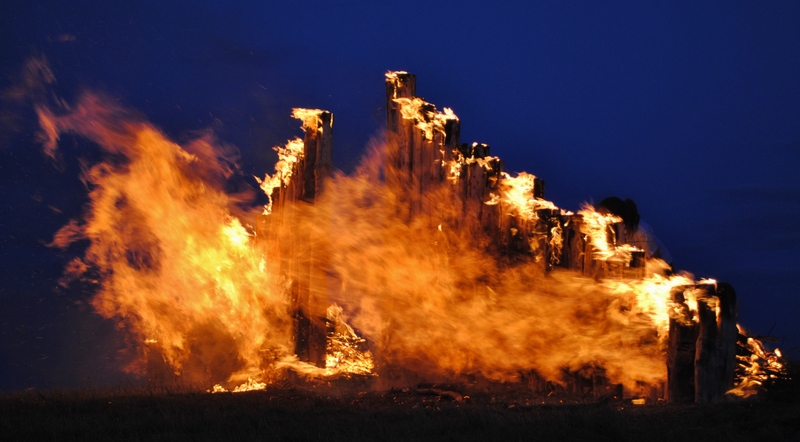 Fire beckoned darkness and called another light. 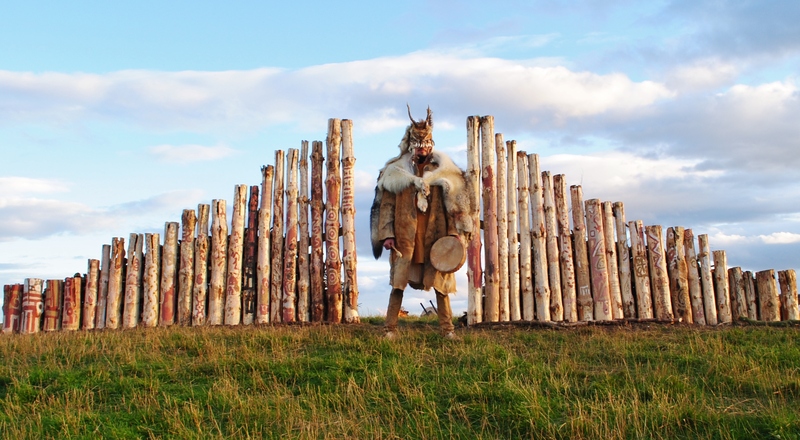 … of rhythms hunted through the ages. Could never be revealed in mornings traces ? Please contact me, if you have any ideas for other BuildNBurn events, we are happy to collaborate. 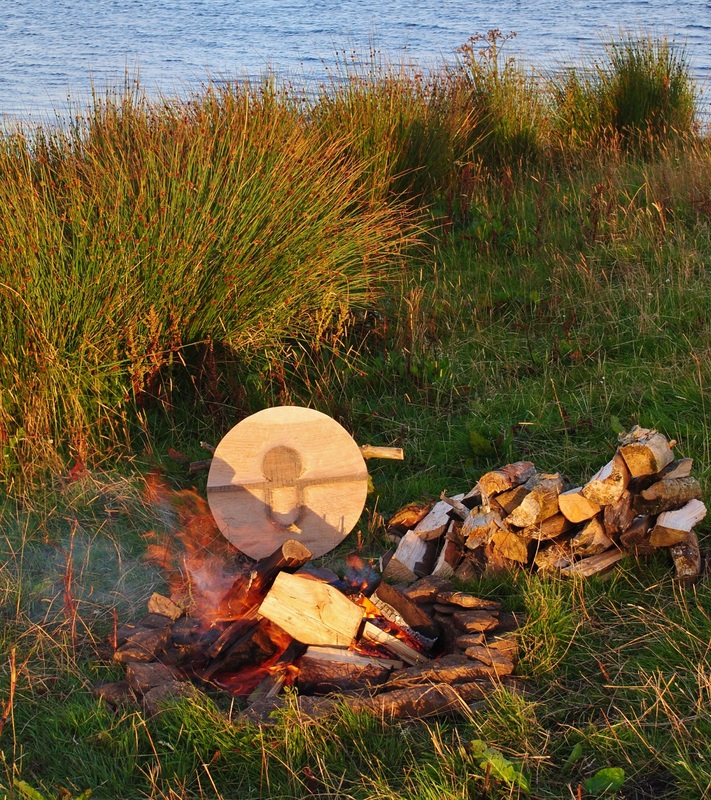 The BuildNBurn presented above was produced as part of the Joseph Anderson 150 Festival organised in collaboration by the University of Glasgow, Cardiff University, Northlight Heritage, the Yarrows Heritage Trust, Venture North and Northshore Pottery. The Joseph Anderson 150 Festival was supported with funding from the E.ON Camster Community Fund, supported by Foundation Scotland and by Eneco and Venture North. The BuildNBurn performance ‘Joseph Anderson Presents The Mysteries of Prehistories’ could not have happened without the support, hardwork and creative efforts of: Tom (Performance and Build); Andrew Baines (Performance); Cara Berger (Technical Advice); Nan Bethune (Storytelling); Alex Carnes (Performance and Build); James Dilley (Performance); Helen Green (Performance and Build); Steve (the sound man) Mills (Audio); and Brianna Robertson (Song and Technical Advice). Thanks also to Ian Giles for providing two carved oak plaques for carbonisation. 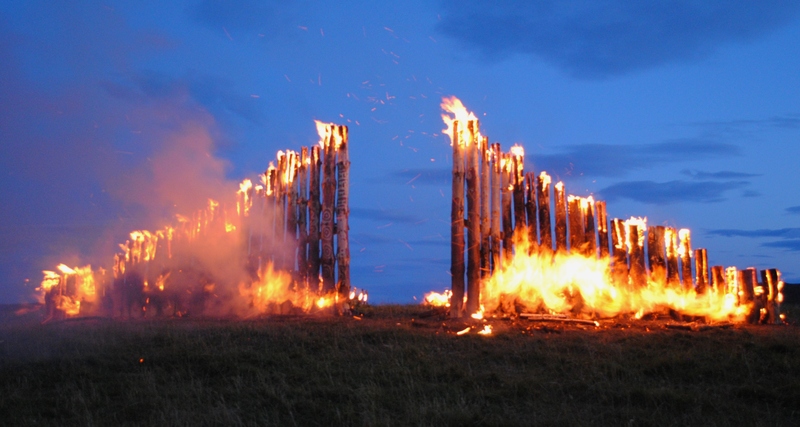 Many thanks to Islay MacLeod and Catherine MacLeod for providing copious quantities of wood and putting their faith in the BuildNBurn team. A special thanks to Amelia Pannett who made Joseph Anderson 150 Festival happen and dealt with too many challenges during the week : but we got there in the end ! When I received a copy of Mac-Talla Nan Creag from Forestry Commission Scotland archaeologist Matt Ritchie I was interested in hearing what had been produced. 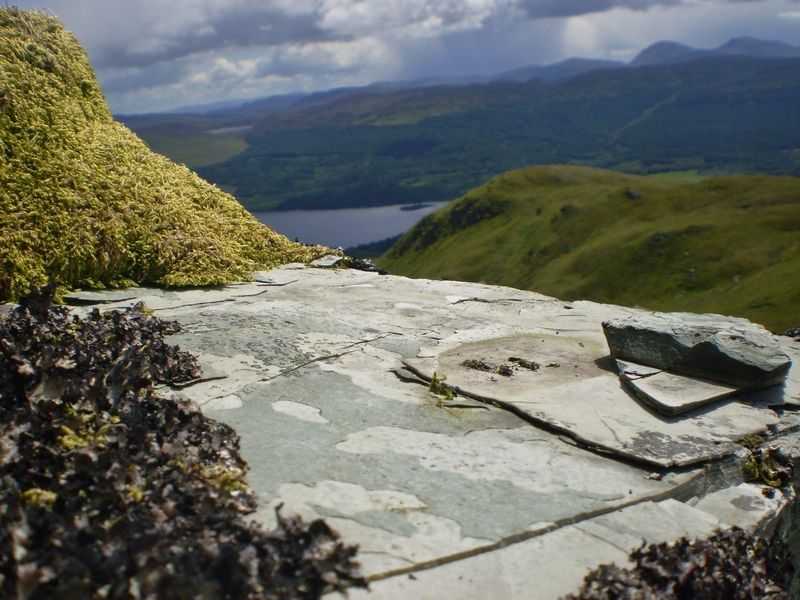 I had previously managed to see an insert from the Mac-Talla Nan Creag LP and was aware the work engaged with the laser scanning of several prehistoric archaeological sites by AOC Archaeology Group. were subject to laser scans producing point cloud data which provided the basis of some of the artwork. What I had seen before as outputs from the laser scan were some striking digital images from the survey of archaeological sites : but to be honest I was a bit doubtful as to whether the resulting music would be of merit. 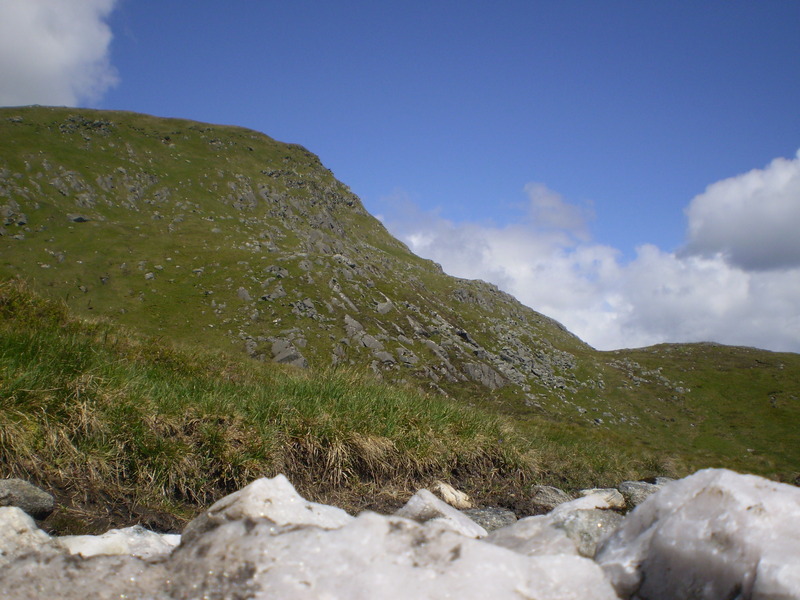 where the corries hold the snow’. 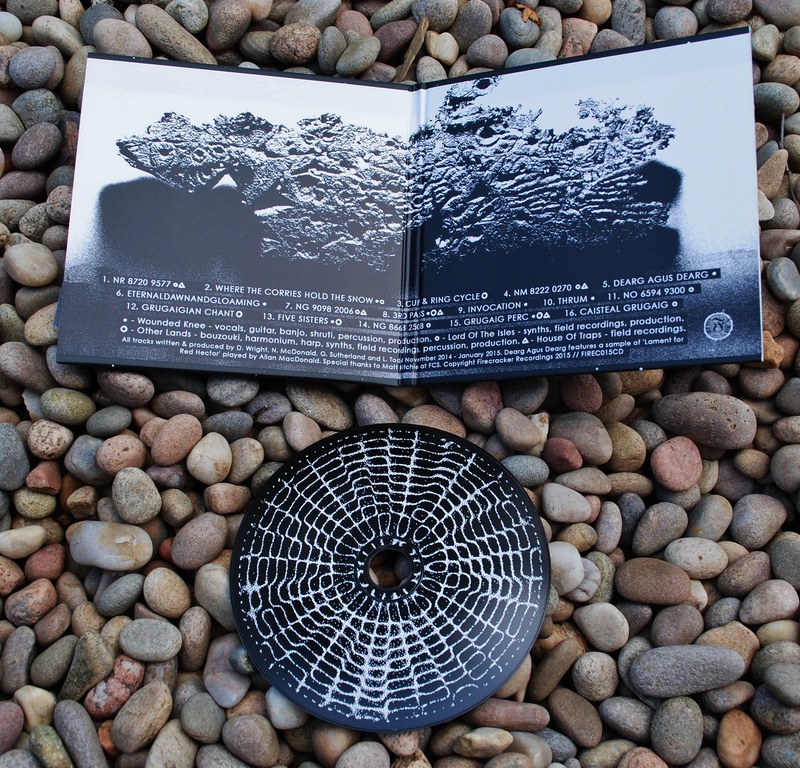 There has also been the bonus of introducing me to the work of some wonderful musicians, Wounded Knee, Lord of the Isles, Other Lands and House of Traps : who appear to have worked collectively in the production of different tracks. It is this aspect of the process of making which is also of significance. Other forms of collective collaboration is something the heritage sector could benefit greatly from in terms of how we approach the production of outputs and outcomes. At times the heritage sector is highly formulaic and methodology driven. Thankfully there are increasing opportunities, and I would argue need, to develop new processes and forms of collaborative expression to better explore our complex relationship to the past and the vital role, in terms of place and identity, this has for our futures. 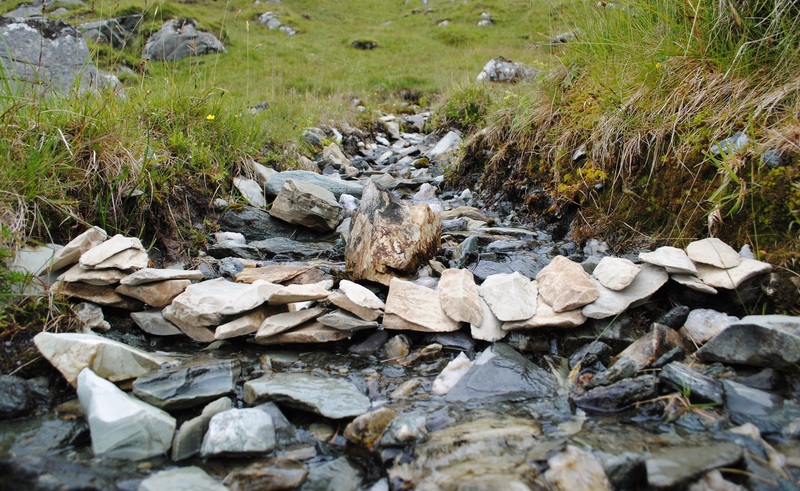 Mac-Talla Nan Creag is a great example of how the ongoing conversation with the heritage of our landscapes can be extended through creative practices. 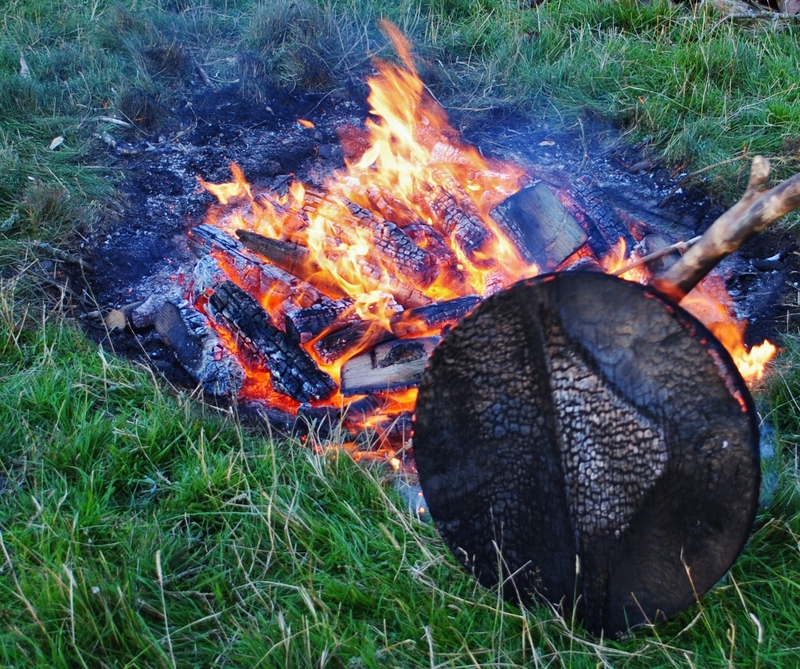 It is also an important reminder that through exploring the past we can produce more than academic knowledge through this conservation: only by the sharing and celebration of our archaeological and historic environment assets through different mediums can we grow their relevance. 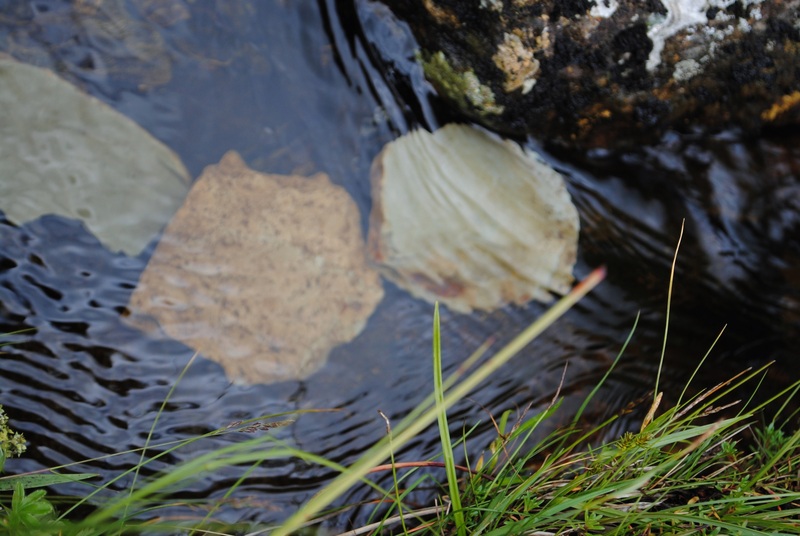 Overall Mac-Talla Nan Creag as a collaborative musical response, to archaeological digitisation, with support by Forestry Commission Scotland to take such an approach, is to be commended. It would, however, be interesting to discuss with the musicians to what degree, and how, the experience of archaeology and its laser scan affected (if at all) their compositions? 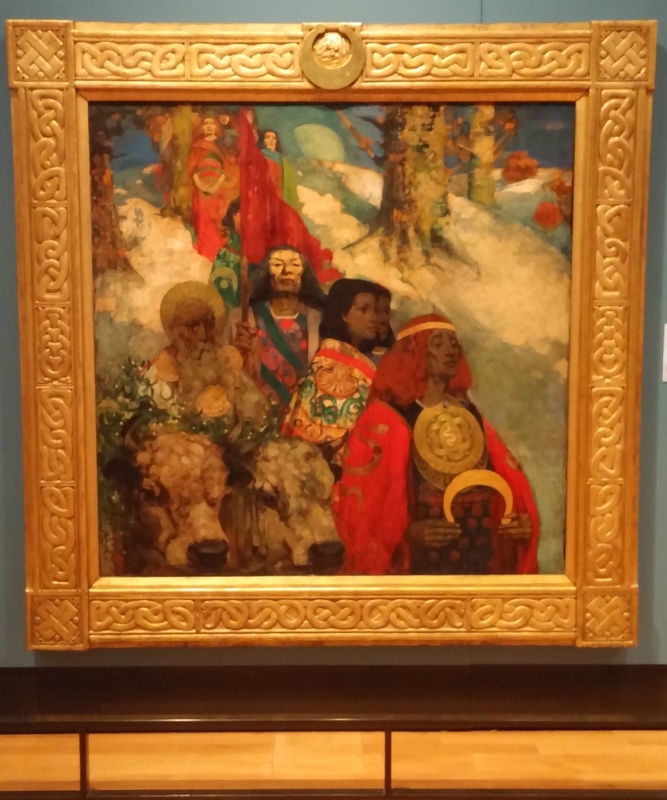 Earlier this year I was privileged to see The Druids: Bringing in the Mistletoe by George Henry and Edward Atkinson Hornel (1890) in the excellent Kelvingrove Art Gallery and Museum. Only seeing the original painting does it proper justice and I urge you to visit the Kelvingrove to see its full wonder. Needless to say this required further investigation. ‘The half-sphere of the moon on the background is reflected in the curve of the hill and the shapes of the priestly insignia, all echoing the cup-and-ring markings‘. Looking at the Druid Landscape, Smith underplays the extent to which the lunar has been evoked through the cool silvery quality of the light and exaggerated topography of the hills upon which the Druids process. Rather it as if they wander from and across the very surface of the moon itself, in turn implying the Druids emerged directly from the cup-and-ring markings themselves and those who produced them. A similar blurring between the realities of topographic forms and the layers of mythological liminality which we inhabit can also be seen in an earlier work by Hornel, The Brownie of Blednoch (1889). In the background we can again see a full moon resonating cup-and-ring marks. 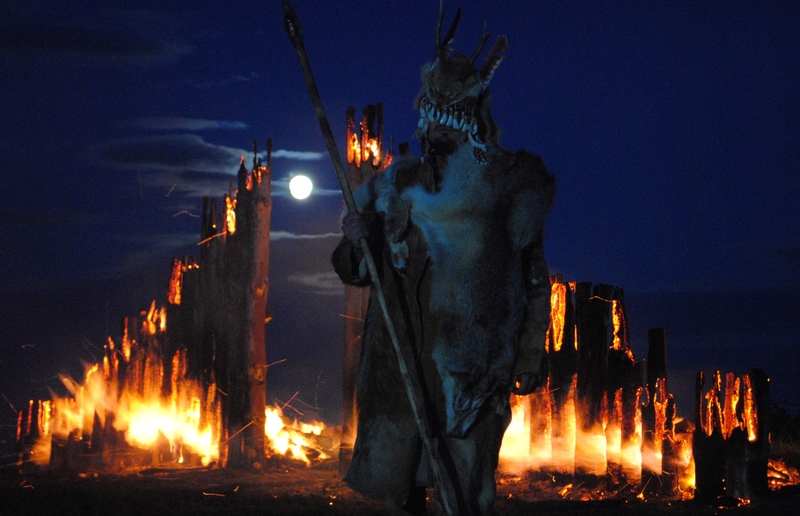 Gallovoidian shepherd beast, beard of circles and cup-marked eyes. A manifestation of the living rock, tor like outcrop, it dominates a landscape (which would typically be portrayed as a pastoral idyll), above which swoop dark clouds suggesting eldar forms and witch-like figures. ‘….he took from a shelf a small china bowl in which was a small bluish stone like bead*. Holding this in his hand, in a few minutes he seemed to go off in a sort of trance, and then began to describe,…,a vision of a procession of priests with sacred instruments and cattle which were somehow connected with the cup-and-ring markings. I cannot remember the details of it; all I can say is the vision appeared genuine, and that he was not drunk. After a time he became normal again, but would not talk anymore on the subject.‘ *I like to imagine this could be a Bronze Age fiance bead most often having been found associated with burials. 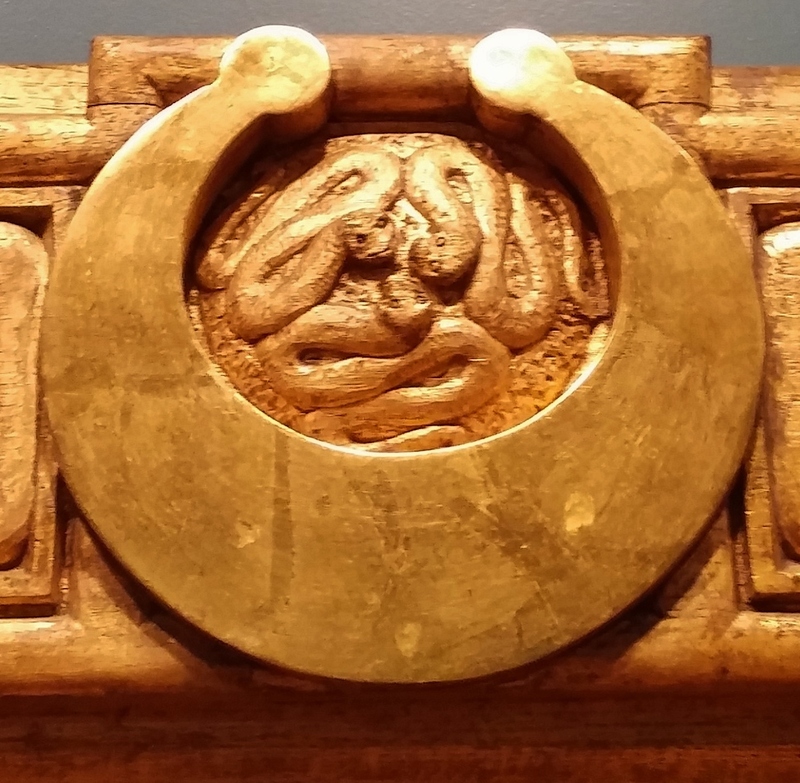 So not only did Hornel first identify the carvings but he also recorded them. So in the late 19th century, rock art about 5000 years old, was being uncovered, casts of which were made, of which photographs were taken, of which an engraving was produced, which is now represented digitally ! 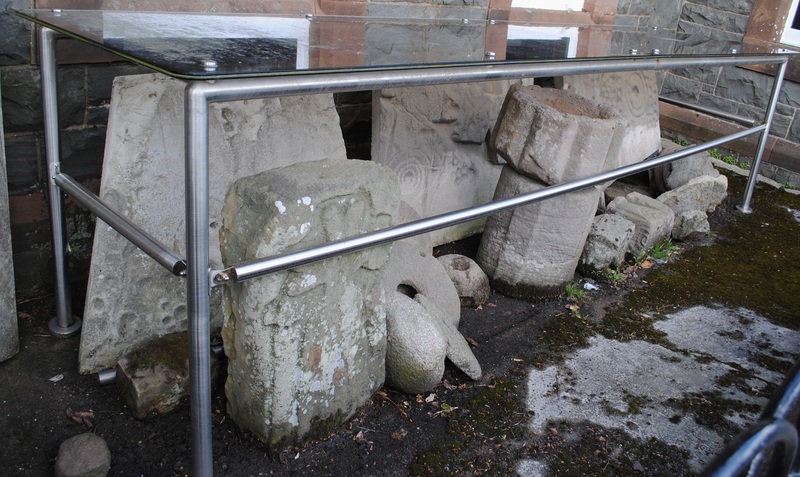 And thus I quickly looked outside to see a nest of carved stones sheltering together through the ages: piled up in front of the casts, quern stones and fonts, Medieval cross and prehistoric rock art reworked as architectural elements of later buildings. A glass and steel framed disparate assemblage of esoteric forms revealing : a compelling urge to collect and display over the ages? witness to M’Kie then curator of the museum. So where did these casts derive ? Situated in a changing world, alive with movements. With depths of skies and shifts of perspective. and its seductive pretense of permanence. Stone reworked and represented, filling the void of times lost. Five thousand year old forms, copied and transformed. 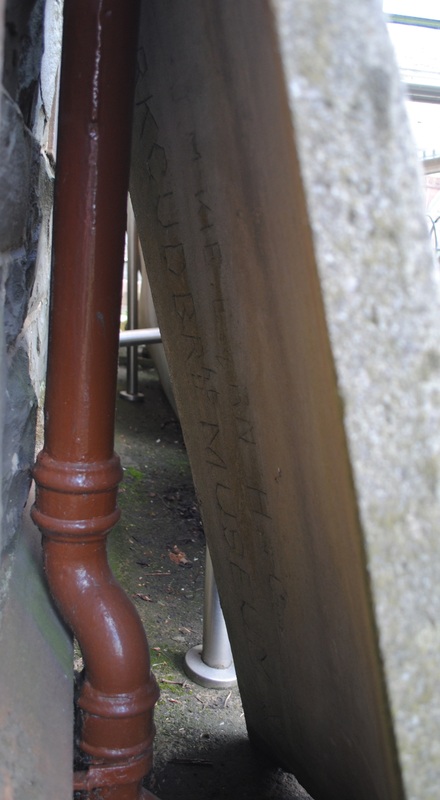 In the library of Broughton House, the residence of Hornel in Kirkcudbright, there are letters which reveal another dimension to this trajectory. Twenty seven letters written to Hornel by artist and archaeologist (or is it archaeologist and artist) F R Coles – replies missing – provide a one sided insight to a friendship hungry for discovery and portrayal, a glimpse of hobbied obsessions and tentative grasps at Druid spectres. 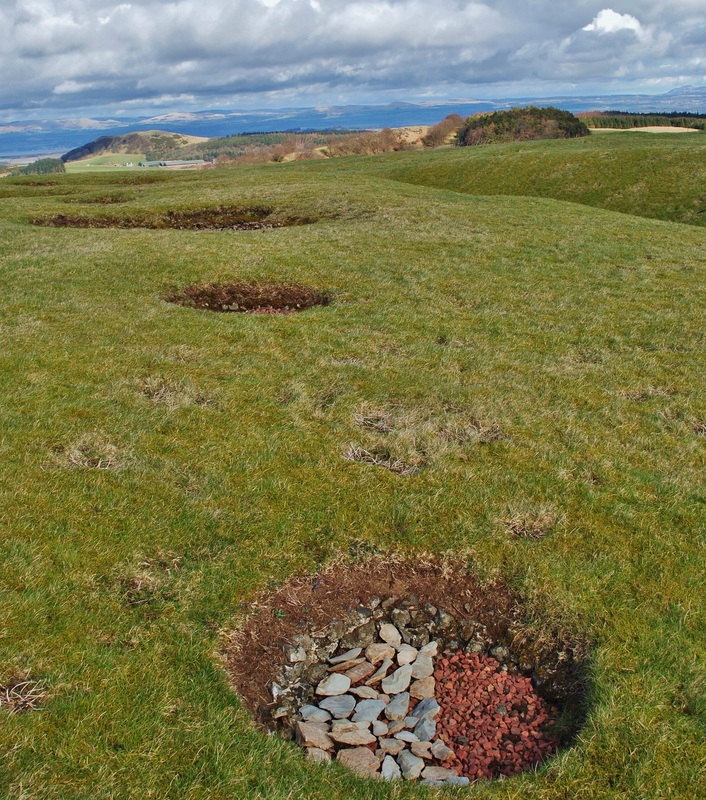 It is also clear then that prior to producing paintings incorporating cup-and-ring marks, not only had Hornel been exploring the Galloway hills searching for exposed rock outcrops bearing prehistoric rock art but when discovered had been illustrating them too. In the case of High Banks, he had also been excavating to uncover more rock art panels : very much then artist as archaeologist. In the same letter to Hornel, F R Coles sketches three cupmarks in the corner, a simple trace of his artistic background, and in the earlier letters refers to cup-and-ring is markings written in full. Not much later F R Coles would move to Edinburgh where he was Assistant Keeper of the National Museum of Antiquities of Scotland from 1897 to 1911. 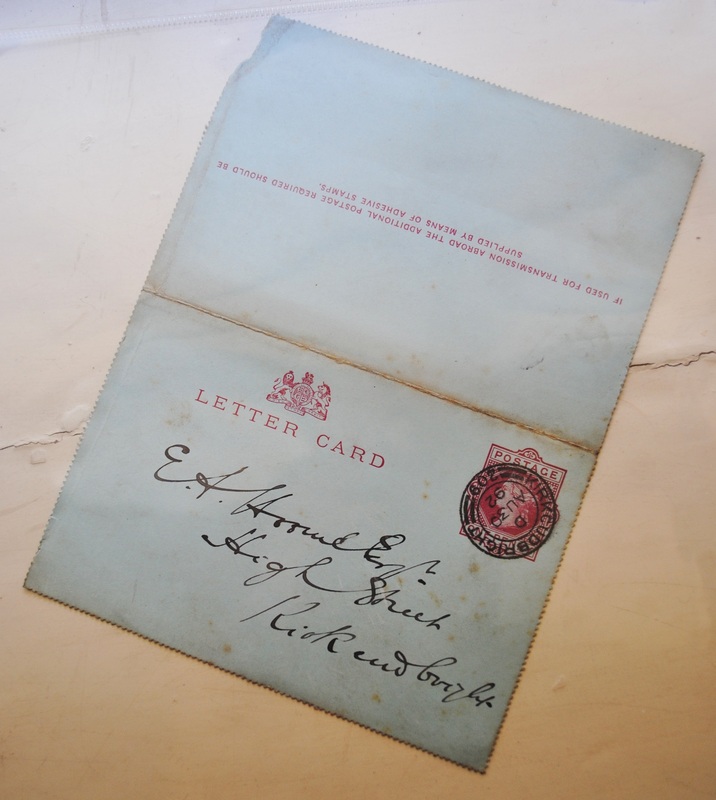 Five years since the original discovery at High Banks, letters from F R Coles (now as archaeologist) continued to Hornel. They reveal another dimension of the ways in which cup-and-ring markings were being portayed by F R Coles, rather than written in full he uses shorthand symbols for cup-and-ring markings. No other abbreviation, or short hand is evident for long or frequently used phrases, only the archaeological subject is reduced : a form of categorical abstraction only too regularly used in the work of the archaeologist. The mark of the archaeologist is, for many, the excavation trench : a theatrical arena which temporarily opens the veil between past and present. 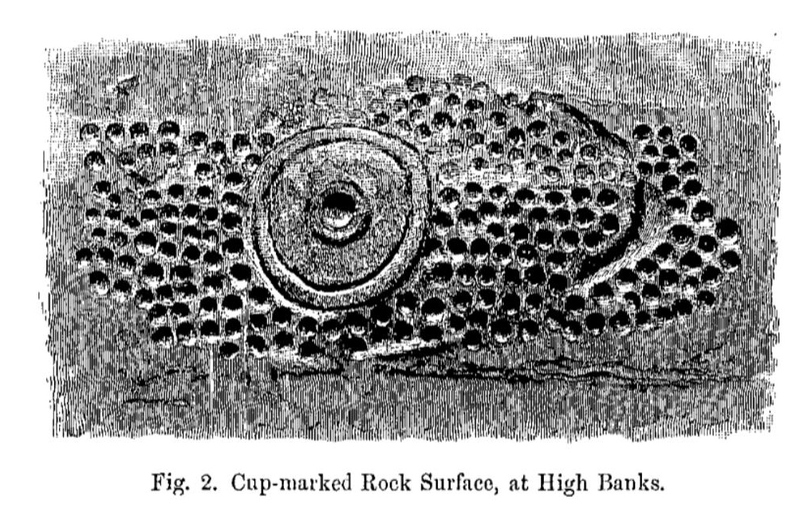 Powerful indeed then that the presencing of the rock art at High Banks was through Hornel’s spade work, without which they would never have been revealed and transformed – cast, photographed, engraved, digitised – (re)presented through the ages. 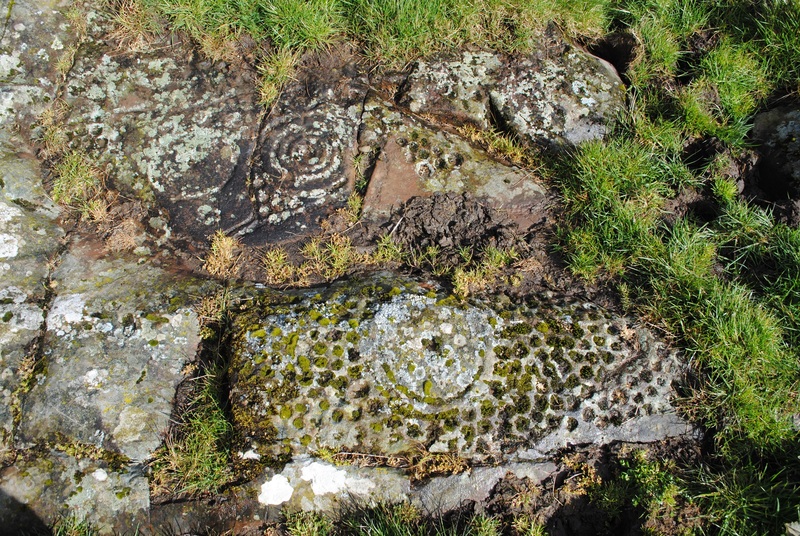 Yet ironically, it is the artists striking imagery of the Druids or the Brownie inhabiting the moonscapes of Galloway, which more actively invites us to dwell in the same landscapes as the rock art may have emerged in – 5000 years ago when it was produced, even then a place thick with myths and legends. Many thanks to Denise Briggs (The Stewarty Museum), Sarah Jackson and Sheila Faichney (NTS, Broughton House) for helping with my investigations. In fairness, F R Coles was engaged in archaeological practice at a time when there was an overwhelming need to identify and record archaeology. His work stands out at the time for his large number of illustrations of sites which he recorded effectively in no small part through his skills as an artist. 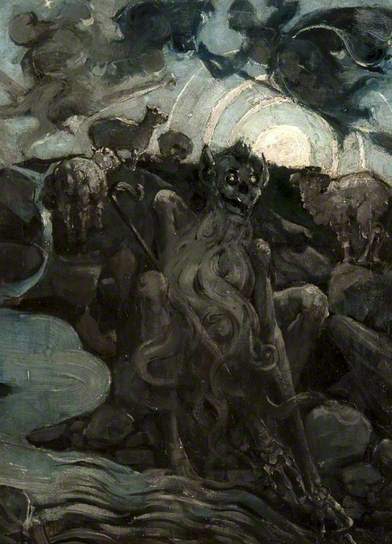 Hornel the artist (informed by the visceral experiences of landscape and archaeology) produced The Druids which, despite its power as a painting, may actually appeal to a limited audience. In contrast, the simple abstraction to . & o by F R Coles, in part anticipated later scholars views that cup-and-ring marks were potentially very powerful as it is their very simplicity of form which allows multiple meanings and interpretations. 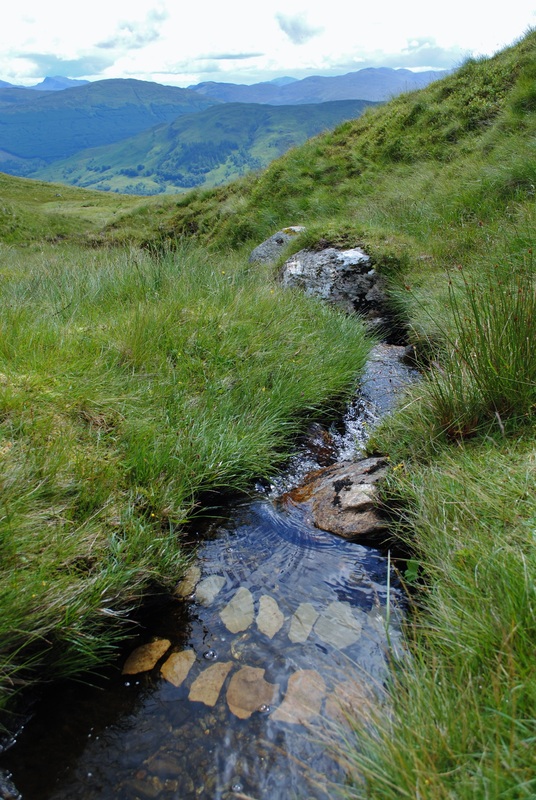 More information about High Banks can be found at RCAHMS Canmore site. 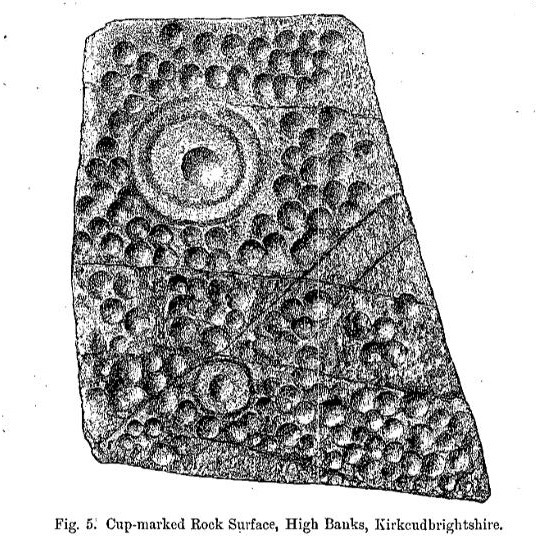 Coles, F R 1888 ‘The recent Cup and Ring Mark Discoveries in Kirkcudbrightshire. (Abridged. )’ Trans Dum Gal Nat His Antiq Soc 5, 41 – 52. 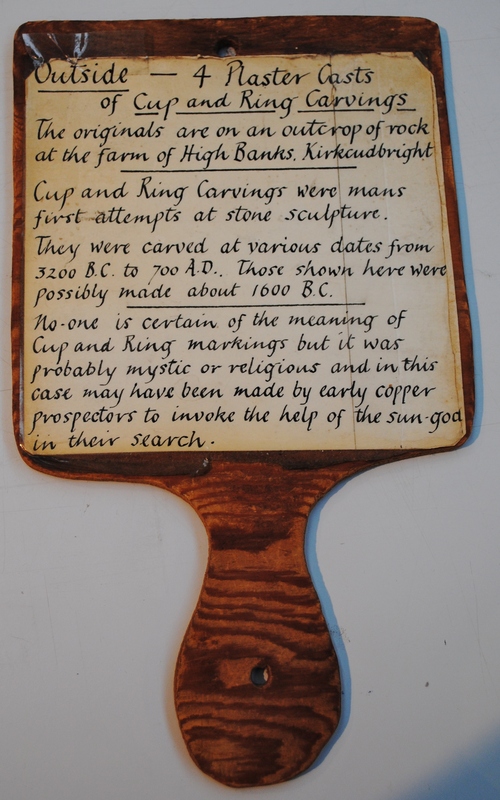 Coles, F R 1895 ‘A record of the cup- and ring-markings in the stewarty of Kirkcudbright’ Proc Soc Antiq Scot 29, 67-91. 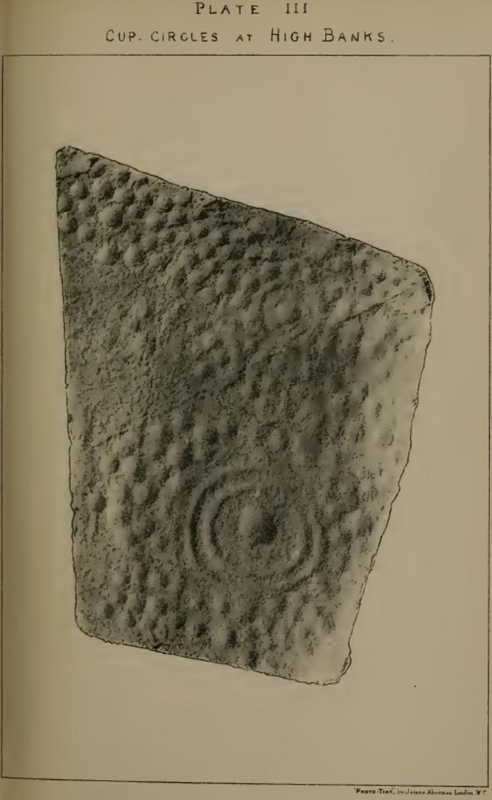 Hamilton, G 1887 ‘Notices of rock-sculpturings of cups and circles in Kirkcudbrightshire’, Proc Soc Antiq Scot 21, 157-8. 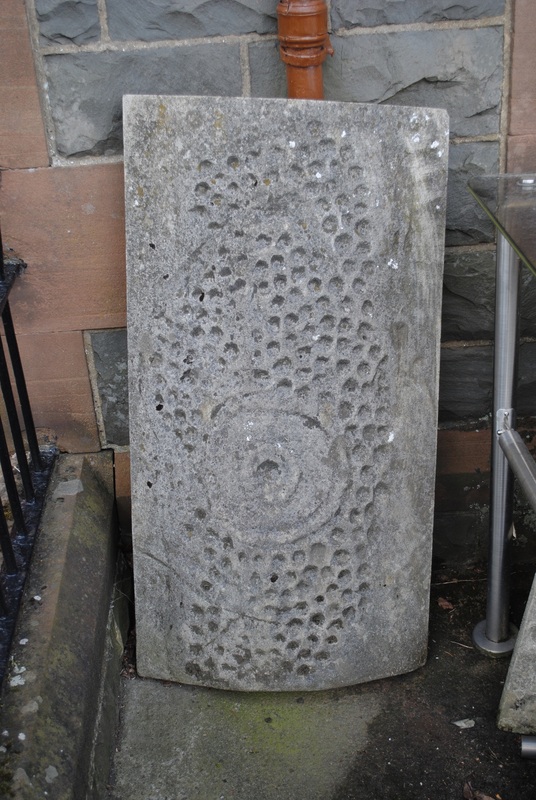 Hamilton, G 1889 ‘Notice of additional groups of carvings of cups and circles on rock surfaces at High Banks, Kirkcudbrightshire’, Proc Soc Antiq Scot 23, 125-30. Hartrick, A S 1939 A Painter’s Pilgrimage Through Fifty Years. Cambridge: Cambridge U. P.
Smith, B 2010 Hornel. The Life and Works of Edward Atkinson Hornel. Atelier Books: Edinburgh.